Just as Avingard closed the door behind him he heard barking coming from the dark cave. He struggled to see in the darkness, which was broken up every few feet by some torches. The barking came closer to Avingard very quickly, so he drew his sword ready for combat. Just as he finished wielding his sword a large dog came leaping into the air towards Avingard, who quickly blocked the dog with his greatsword. The dog yelp after hitting the steal and then the ground. Seizing the opportunity, Avingard brought his sword down upon the vicious dog silencing it forever. Not wanting to attract any attention, Avingard stopped until the footsteps of a person can be heard walking in the other direction. This allowed Avingard to slowly move forward into the cave until he came to a fairly good-sized room. The room was lit much better than the tunnel he had just been in, so he could see much better. At the other end of the room was a bandit, with his back to Avingard. Thinking of using the element of surprise, hoping it would work better than at Silent Moons Camp, Avingard move slowly forward. Unfortunately, his armor made too much noise and the bandit turned and saw Avingard with his sword drawn. The bandit readied a bow and began to fire an arrow at Avingard. 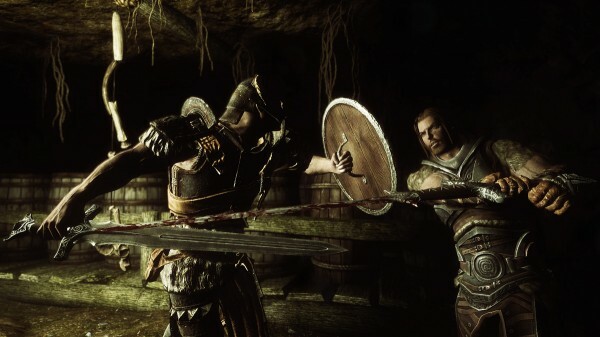 Before he could react, the arrow had grazed Avingard’s arm causing some blood to drip down onto the handle of his sword. Withering in pain, Avingard found a large support that he could use to protect himself from the flying arrows. The bandit continued to aim at Avingard as he slowly approached the concealed Breton. Then without any warning, Avingard lunged towards the archer, and with one swift slash, cut the archer down. Wincing from the injury to his arm, Avingard looked it over. It wasn’t too bad, so he decided not to use a healing potion, but instead searched the archer and continued forward into Redoran’s Retreat. As he entered the next tunnel, another bandit wielding a large warhammer came racing from the other end. The bandit stopped just short of running into Avingard and swung the warhammer, missing Avingard by inches. Avingard returned the attack, but missing with a slash, and sending his sword clanging off the wall. The bandit let fly his warhammer, hitting Avingard in his right arm, knocking Avingard against the wall. The bandit, seeing a golden opportunity, swung his warhammer at the head of Avingard, who just moved out of the way, causing the warhammer to smash against the tunnel wall. Regaining his composure, Avingard swung his sword at the bandit, hitting him in the side. The bandit withered in pain, but remained on his feet, and again swung his warhammer at Avingard. Dodging the large weapon, Avingard raised his sword above his head and brought it down on the bandit. The bandit didn’t fall immediately, but stood almost in a daze-like stance, so Avingard repeated the attack two more times before the bandit fell dead to the ground. After searching the bandit, Avingard moved down the tunnel until he came to a well-lit, large room. Almost immediately after entering the room, a large bandit wearing all iron armor ran towards Avingard with a sword in his right hand, and a shield in the other. The bandit lunged at Avingard, missing with his sword. The two combatants slashed at each other, both missing. Avingard was starting to become exhausted with the number of battles he had been part of today, so he stayed more on the defensive against this bandit. Avingard battles the bandit Chief. The bandit continued to remain aggressive, even backing up Avingard into a corner. Realizing that his life would be over unless he gave himself more room, Avingard began to slash the bandit as furiously as he could. The bandit backed off, which then allowed Avingard to be in a better position for the fight. After a few minutes of back and forth slash, the bandit lost his balance when he stepped on a rock. Avingard, seizing the opportunity, swung his greatsword and struck the bandit in the side of the head. The bandit fell to the ground with a loud thud, and remained motionless. Avingard searched his fallen foe, and then looked around. He noticed a chest ahead of him, which he opened and took a few things he thought he could sell for some good money. He also found a hand-drawn map that showed a dotted line and an “X”. As he turned around he noticed another chest. Opening the second chest he found some nice iron boots, which looked enchanted. He immediately replaced his current iron boots for the new ones. Avingard realized that no other bandits can be found in this cave, he left Redoran’s Retreat and returned to Whiterun for his reward.